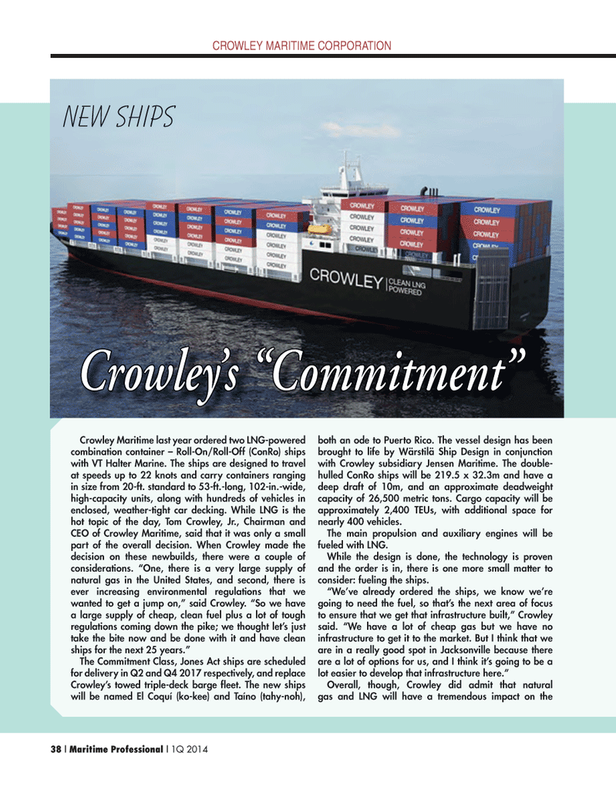 Crowley’s towed triple-deck barge fl eet. The new ships will be named El Coquí (ko-kee) and Taíno (tahy-noh), both an ode to Puerto Rico. The vessel design has been brought to life by Wärstilä Ship Design in conjunction with Crowley subsidiary Jensen Maritime. The double- hulled ConRo ships will be 219.5 x 32.3m and have a deep draft of 10m, and an approximate deadweight capacity of 26,500 metric tons. Cargo capacity will be approximately 2,400 TEUs, with additional space for nearly 400 vehicles.